Elise is my daughter, and when it comes to Shabbos cooking, I get a lot of ideas from her. Like this delicious kosher deli roll. And like my daughter, it is beyond ordinary. ...and boys are always starving, as I have learned! This and many other delicious kosher recipes are now in print in my first book, Cooking for the King ~ recipes for life . This not like any other kosher cookbook. It is so much more~It's the cookbook women I respect have asked for: besides offering a wide range of make ahead kosher recipes and ideas perfect for any Shabbos or Yom Tov, it is chizuk, it is elevation. It is sometimes funny and sometimes serious. It speaks to who we are and who we really want to be. It's easy to order your copy (and it makes a great gift, too). The first edition that made its debut just before Rosh Hashanah 5774 includes this delicious recipe and many more. You'll want to try the Harvest Bisque Butternut Squash Soup, Good as Gold Potatoes, and Caramelized Onion Chicken. I'm getting rave reviews on those recipes! To learn more about Cooking for the King and why I wrote a book of Jewish thought for women, that also happens to be a very good cookbook, click here. 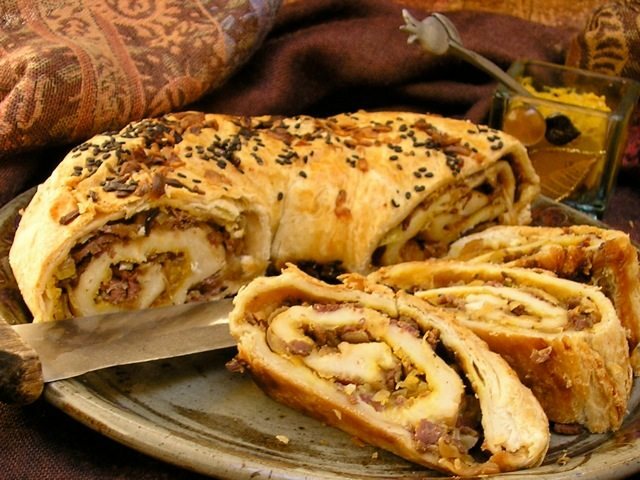 A delicious first course for your Shabbat menu is this yummy kosher deli roll with an assortment of appetizer spreads and salads from Cooking for The King and theKosherChannel.com.